It is probably no new thing for many followers of Premier League to see top coaches being sacked after a losing a game to West Brom. Many Managers from Paolo Di Canio to Roberto Mancini, Sir Alex Ferguson, Mick McCarthy and also two Chelsea's former Boss, Andre Villas-Boas and Roberto Di Matteo. Andre Villas-Boas was in charge of Chelsea for 9 months and after a run of bad games and a 1-0 loss to West Brom, he was axed by Roman Abramovich. Roberto Di Matteo was someone that everyone expected not to be sacked by the London Club. He won the Champions League for the Club and also was a former player. With the Blues on a winless run, a dismal 2-1 loss at the Hawthorns was followed by a sacked letter. 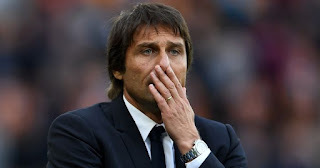 With all the record of Coaches getting sacked after losing to West Brom one would say Antonio Conte's job is really at risk and a loss to them on Monday might the end of the journey for him at the London Club. Chelsea are already on a run of some bad games, and their last game was against Watford which was a 4-1 loss.